Mortgage debt overhang from the housing bust has meant lack of middle-class spending power and consumer demand, preventing the economy from growing. The problem might be fixed by a new approach from the Fed. But if the Fed won't act, counties will, as seen in the latest developments on eminent domain and litigation over MERS. Former Assistant Treasury Secretary Paul Craig Roberts wrote on June 25th that real US GDP growth for the first quarter of 2014 was a negative 2.9%, off by 5.5% from the positive 2.6% predicted by economists. If the second quarter also shows a decline, the US will officially be in recession. That means not only fiscal policy (government deficit spending) but monetary policy (unprecedented quantitative easing) will have failed. The Federal Reserve is out of bullets. Or is it? Perhaps it is just aiming at the wrong target. The Fed's massive quantitative easing program was ostensibly designed to lower mortgage interest rates, stimulating the economy. And rates have indeed been lowered -- for banks. But the form of QE the Fed has engaged in -- creating money on a computer screen and trading it for assets on bank balance sheets -- has not delivered money where it needs to go: into the pockets of consumers, who create the demand that drives productivity. Some ways the Fed could get money into consumer pockets with QE, discussed in earlier articles, include very-low-interest loans for students and very-low-interest loans to state and local governments. Both options would stimulate demand. But the biggest brake on the economy remains the languishing housing market. The Fed has been buying up new issues of mortgage-backed securities so fast that it now owns 12% of the mortgage market; yet housing continues to sputter, largely because of the huge inventory of underwater mortgages. 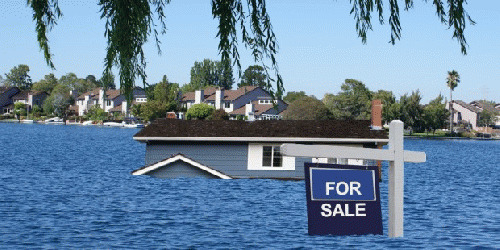 According to Professor Robert Hockett, who originated a plan to tackle this problem using eminent domain, 40% of mortgages nationally are either underwater or nearly so, meaning more is owed on the home than it is worth. Seventy percent of homes that are deeply underwater wind up in default. Worse, second mortgages are due for a reset. Over the next several years, principal payments will be added to interest-only payments on second mortgages taken out during the boom years. Many borrowers will be unable to afford the higher payments. The anticipated result is another disastrous wave of foreclosures. The mortgage debt overhang was the result of financial deregulation and securitization, which created a massive housing bubble. When it inevitably burst, housing prices plummeted, but mortgages did not. The resources of the once-great middle class were then diverted from spending on consumer goods to trying to stay afloat in this sea of debt. Without demand, stores closed their doors and workers got laid off, in a vicious downward spiral. The glut of underwater mortgages needs to be written down to match underlying assets, not just to help homeowners but to revive the economy. However, most of them cannot be written down, because they have been securitized (sold off to investors) in complicated trust arrangements that legally forbid renegotiation, even if all the parties could be found and brought to agreement. The parties themselves cannot renegotiate, but the Fed could. The Fed is already voraciously buying up mortgage-backed securities. What it is not doing but could is to target underwater mortgages and renegotiate them after purchase, along the lines of the Home Owners' Loan Corporation (HOLC) created during the New Deal. The HOLC was a government-sponsored corporation created in 1933 to revive the moribund housing market by refinancing home mortgages that were in default. To fund this rescue mission without burdening the taxpayers, the HOLC issued bonds that were sold on the open market. Although 20% of the mortgages it bought eventually defaulted, the rest were repaid, allowing the HOLC not only to rescue the home mortgage market but to turn a small profit for the government. In 2012, Senator Jeff Merkley of Oregon proposed the large-scale refinancing of underwater mortgages using an arrangement similar to the HOLC's. Bonds would be issued on the private bond market, capitalizing on today's very low US government cost of funds; then underwater mortgages would be bought with the proceeds. For the bonds to be appealing to investors, however, they would need to be at 2-3% interest, the going rate for long-term federal bonds. This would leave little cushion to cover defaults and little reduction in rates for homeowners. The Fed, on the other hand, would not have these limitations. If it were to purchase the underwater mortgages with QE, its cost of funds would be zero; and so would the risk of loss, since QE is generated with computer keys.